Holy photos, Batman. These are just the ones from our phones. I decided I needed to break things up into two posts, so today I'll tell you guys all about our adventures, and on Wednesday, I'll share the photos I got with Big Daddy. I'm really pleased. Winter Wonderland. Neel and I have been in some big snow over the course of our years together. There was the Blizzard of 1993, one winter when we were living in Central Pennsylvania and got over 80 inches, a trip to Yosemite and an amazing lodge where it started snowing the night of our arrival and dumped two feet on us. This trip was kind of like that. As soon as I booked our condo, we started watching the weather, hoping mostly for lots of slopes open and no 70º days (it is early March, after all!). When the weather reports started showing signs of Winter Storm Saturn, quite honestly, we were afraid to hope. When they showed a forecast of 20+ inches over the area we'd be traveling to, well, I knew that would never come true. I'd be thrilled if Neel and Callum got a few inches, enough to ski on some fresh powder and enough for me to enjoy it gently falling, but come on people. This kind of thing doesn't happen to us. Still, we watched the timing, and made sure to get to the top of the mountain early Tuesday evening. Callum was itching to get on the slopes, so once we dropped of our stuff, I drove the guys down to the resort for some night skiing. As soon as we stepped out of the car, we started to see flurries. Here in the Tidewater we're so used to forecasts for snow not going our way, it was still hard to imagine it might happen. Somewhere along the way we realized that we'd forgotten Callum's coat (nice, huh? ), so as we took advantage of end of season sales and stocked him up, we asked the clerk about the upcoming storm. She said, "Um, yeah. Make sure you go ahead and bring wood into your house. Have lots of candles and matches. Do you have a flashlight? We do have blackouts on the mountain." Honestly, losing power never once occurred to me. I went back to the condo, grabbed some wood on the way down, and tucked in with the doggies. The first pictures at the top of this post, I took while Neel and Callum were off having the time of their lives. Our condo opened on to a bit of a grassy knoll, and the dogs loved sniffing around. The first time we went out it was spitting snow, and each subsequent time we peeked out the door, the flakes got thicker. 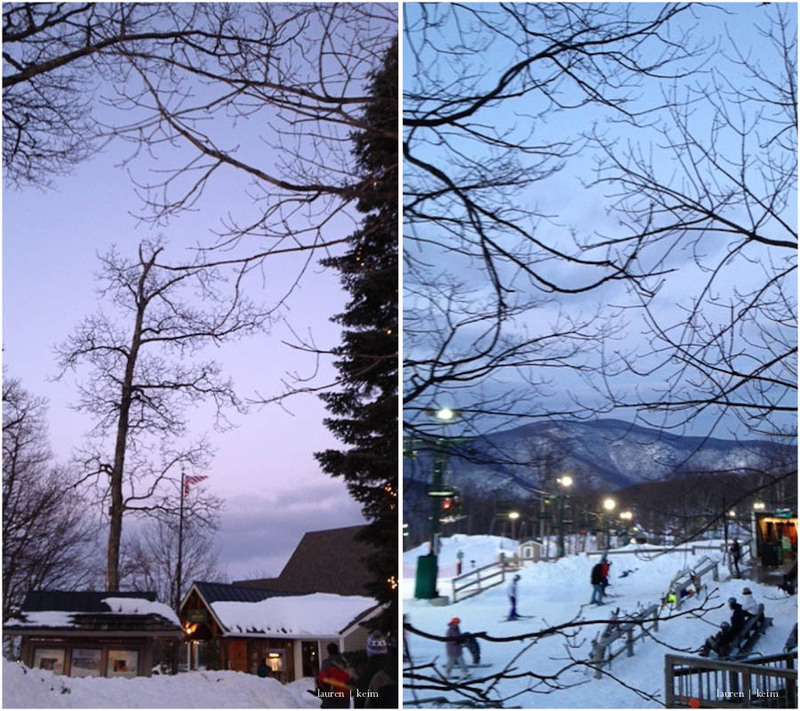 We had an easy view of the lights of the ski slopes, but after about two hours I looked up and the lights were gone! I couldn't see them any more! I assumed the resort had shut down for the night so I texted Callum who said, "No." They were still skiing. It was just snowing too hard for me to ski. An hour later he called to say they were coming home. Visibility had dropped and the wind kicked up. They couldn't see more than a foot in front of them. Time to call it a night. Callum slept on a pull out bed in the living room in front of the fire, and we all woke up at five to find the snow still coming down and the drifts piling high. Neel and I crawled into bed with him to watch out the patio windows and see the sun come up. The dogs were worried. 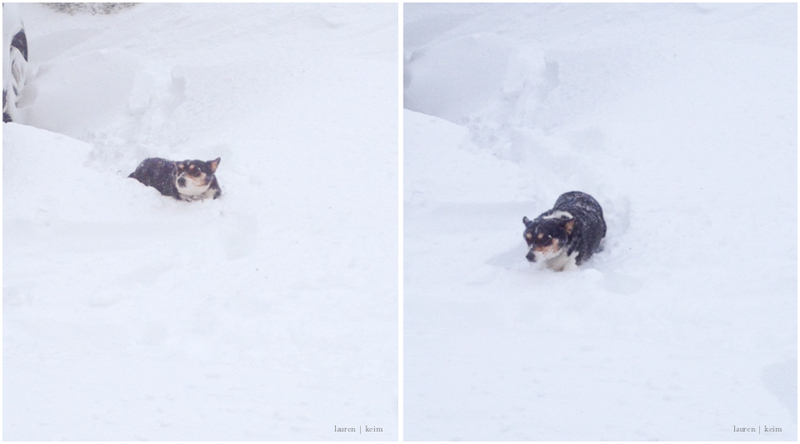 I'd be worried too if the snow were higher than my head. Doesn't Thea look concerned in that picture? After a hearty breakfast, we checked on the slopes and got the word that they were all open, so Neel and Callum got suited up and called the shuttle to come and pick them up. Except. The shuttle had flipped over in a ditch. They said they'd call us back, so for a bit Neel and Cal waited. No call. So my boys decided to ski into the resort. Yikes! They made it, no real problem. Nothing more than deep and powdery snow where if you stopped for a second your skis sunk up to your knees. My son was determined. DAD 11:23 a.m.: Now all "we" have to worry about is power. ME 11:25 a.m.: Uh, power just went out. DAD: 11:26 a.m. Your fault. Cal called shortly after to say that the power was out all over the mountain. He'd been getting ready to head out for a ski when the snow patrol stopped him, saying, "Don't go down!" People were stuck at the base of the mountain and on the lifts, and the wind was picking up. Neel and Callum were stuck at the resort with no shuttle. The skied in, and they had to walk home. I built up the fire and tried not to worry about them trudging up the hill in the wind and snow. In truth, it took less time for them to get home than I expected. Only an hour. We warmed everybody up and snuggled under blankets to play Monopoly. Five hours later, lights back on! Despite the blazing fire, the temp had dropped over ten degrees in the condo, so I'm really glad we didn't have to go through the night without heat or light. Shortly after the lights came back on, the owners called to check on us and since they didn't have renters checking in until Friday, they graciously allowed us to stay another day and night. What a relief! At this point the snow was still coming down, the car was snowed in and there was no sign of stopping. Now we could relax about getting off the mountain and Callum could finally, finally, FINALLY ski. Sometimes things really are worth the wait. That night, while it was still snowing, we walked the dogs. Because of the location of her tumors, Violet has trouble navigating stairs. Or so she tells us. She bounded up and down the five sets of stairs at the codo with total ease. 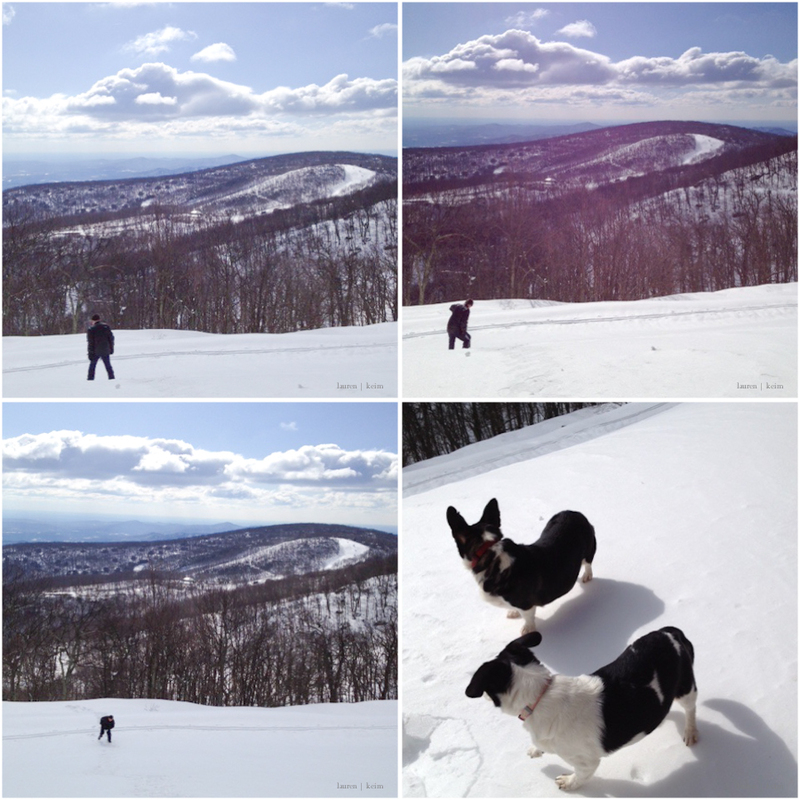 Both our girls were total snow bunnies! When Neel and Callum headed out to ski on Thursday, I shoveled a path out the patio door to snap some photos of the mountain. I sank in drifts past my thighs. By Friday morning there was a crust on the snow that, if we treaded lightly, we could walk on. Dogs especially! Callum got some photos for us too, on the mountain and of his nighttime fire. It was a wonderland everywhere you turned. Thirty some inches they got. It snowed for more than 24 hours and the winds were steady at 40 MPH that whole time. Some storm to be perched on a mountain top, and really, I wouldn't have wanted to be anywhere else. Callum got his skiing in, and we got some adventure in too. Who could ask for anything more?